Seriously how is Amy Winehouse not dead yet? It’s people like her who live until their 93, but then some other schmuck tried pot for the first time and dies immediately. 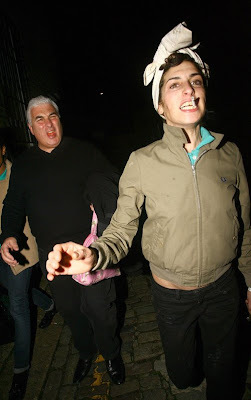 Amy Winehouse was being gracious and greeting her neighbors in London with her father, Mitch, the other night. She was looking rested, peppy, easy, breezy, and beautiful. Maybe she’s born with it? When Winehouse kicks the rusted bucket, I hope they don’t bury her. I hope they stuff her like they do with some beers when they die. I’d like to see a stuffed Winehouse propped up outside of her London home. Perhaps place a witches hat on her head during Halloween and a Santa hat on her head during Christmas. The possibilities are endless.